Larger version here for your inspection! Another photo taken near the place I was staying in Mammoth. I was wandering around with the 70-300mm lens on my camera looking for birds to photograph. 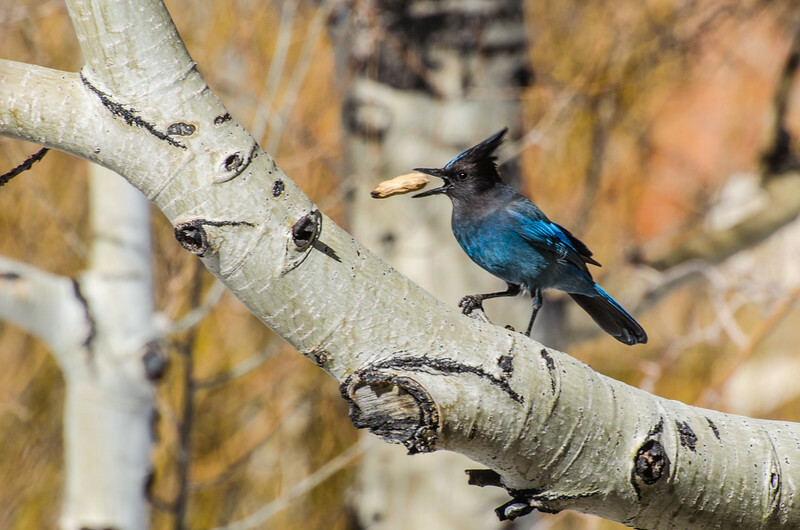 And ta-da, this Steller's Jay landed in a nearby aspen with a peanut. I have no idea where he got the nut -- I didn't give it to him and if I had peanuts, I would have hogged them to myself. The photo was shot at 1/320 shutter speed and f/13. I wasn't trying to get a nice bokeh -- the out of focus background (detailed explanation of bokeh here). But I was pleasantly surprised at how cool it looked when I downloaded the photos to the iMac. Perhaps it was my subliminal genius at work, although I suspect by subliminal side isn't so smart. So here's my big photo tip: if you're shooting something, try a variety of apertures to see what it looks like with both a shallow and big depth-of-field. More photos from the Mammoth area on my SmugMug site; license one and put it on a billboard alongside a freeway just for fun. And follow me on Twitter.